While making correlations between Pan African and Black Nationalist thought along with dystopian fiction, writer Alicia McCalla notes, "there's a large hole in dystopian YA [Young Adult fiction] where the questions of society, race, and minority culture should be". McCalla further offers the idea that young adult fiction is the cornerstone for the birth of critical thinking in the lives of tweens and teenagers. If these books are widely read and the intertwining themes of race and white supremacy are missing, the audience is done a "disservice". Film relies heavily on image and interpretation along with dialogue and story. It ranges from spoon- feeding to astronomically vague. When I think back on some of my most memorable experiences with my favorite dystopic science fiction films, they often imply the significance of a character's race in the wider universe in which they are positioned. The very fascinating of these characters are often "the last" or "the survivor" in such bleak outcomes. At times, their lives are critical to human existence and offer an understanding of what it means to be human more than any other character in the film. 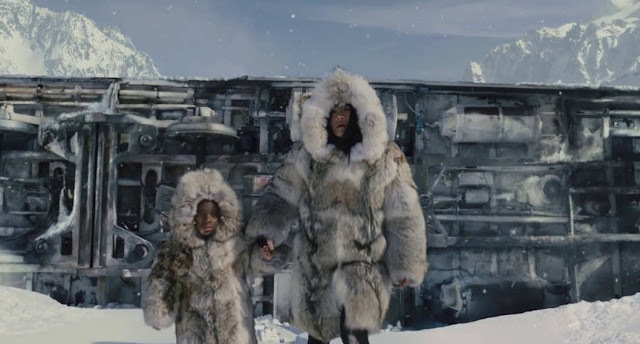 It is amazing to me, the power of science fiction, often used as a tool for liberation, daring to imagine beyond our own reality that enforces the very real narrative of non-white eradication, especially Black people, that stories told by Blacks (and not always on film) offer Black characters a place outside of death. They almost, in a sense, transcend it. Beating the extreme of odds in order to do what we can gander, because as palatable sci-fi suggests, bursts our imaginations open with un-neat conclusions. Below are just a slither few that are of note for their beautiful capture of isolation, despair, underestimation, and hope. I've written about the character of Kee (Clare-Hope Ashitey) in an earlier essay. 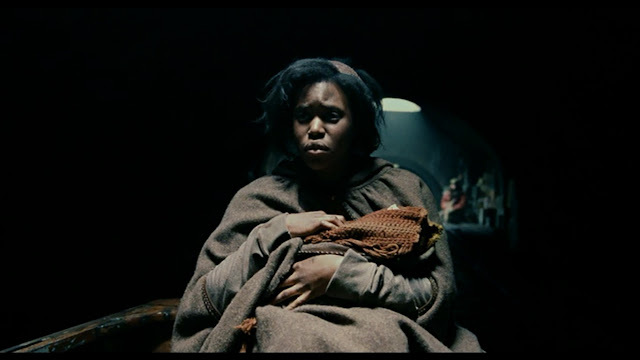 The overwhelming preoccupation of desirable citizens in this desperate state of England, just a slither of what worldwide infertility has done to humanity is quite interesting where the hope to end this desperation is found in the most high of undesirables: a Black, poor female immigrant. While those she has grown to care for perish, she in the end along with her newborn daughter are meant to learn with each other how to bond without any reference to the "natural act" of parenting and force a society to maybe begin to value all life. 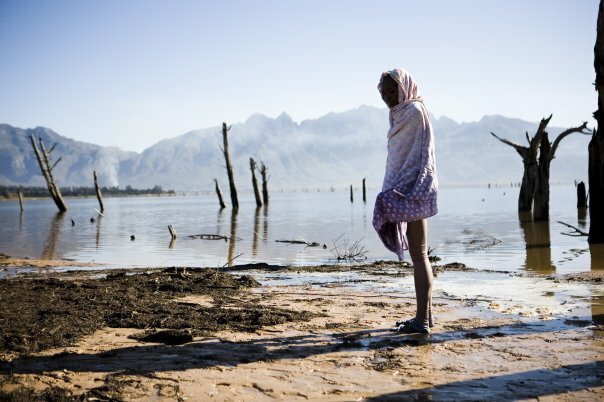 Defying authority, Asha (Kudzani Moswela) may be the only person in her community that, as a scientist discovers a way to break the spell of water extinction above ground. She escapes the suppression of this mission and makes her way to the open earth to plant the promising germinated seed in what is a beautiful, yet desolate landscape that is technically breathtaking. Pumzi throughout is a meditation in isolation. Asha's motives are rooted in hope, she alone has the will to imagine nature's revival. Action driven and seamless, the various themes, visuals, and characters running through Snowpiercer is a sense feast. It manages in the end to have young Timmy (Marcanthonee Reis) and Yona (Ah-sung Ko) stand alone outside of the life-sustaining train to discover that Earth could be inhabitable for humans once more. An exploration in the detrimental development of class divisions, Snowpiercer demonstrates that only the beaten and restrained will dare, reject, and move humanity forward. The lives of those who are non-white, female, and poor are fragile yet indignant as well as resistant in their ability to thrive despite nasty systems that feed off of their collusion. Science fiction so consistently has been an exercise in this narrative of how we live is made fantastic in storytelling likely since the beginning of the act of storytelling itself. In a society where people of color are still the punchline in speculative work, it's nice to know that some artists from various perspectives still imagine the lasting image in an audiences psyche being that of a survivor who isn't just Ripley or whomever Matt Damon is playing.